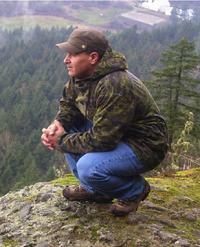 Coast Salish Artist Joe Jack was born and raised on the Cowichan Indian Reserve on Vancouver Island, British Columbia. The traditional Coast Salish Art, and the spectacular beauty and history of this vast ancient Salish community is where this Cowichan Artist still finds the inspiration, and the creativity to carve distinctively elegant works of traditional Native Coast Salish Art. Joe Jack's traditional artwork provides a small glimpse into the historical traditions, culture, and belief systems of the Coast Salish people, and the enduring rich legacy of his Coast Salish Indian Ancestors. 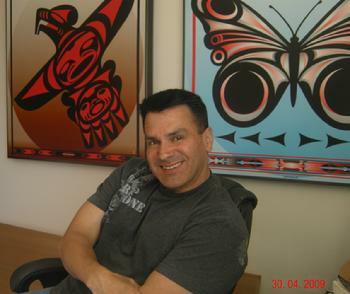 For the last 25 years Joe Jack has worked extensively in creating works of traditional Salish art in beautiful gold jewellery; wedding rings, bracelets, earrings, and pendants. He enjoys spending time creating original and limited edition prints, cedar sculpture, and most recently designing and building traditional Salish racing canoes. World-class craftsmanship, precious materials, and the elegance of traditional forms are combined to create an investment for the future, with the quiet romance of a previous era...a spiritual journey into an ancient world. "As I sit on top of Mount Tzouhalem, I am truly mesmerized by the beauty and the rich history of the valley below, the beautiful sky above me, and the strength of the mountains beside me. This Mountain and Valley is a very sacred place it holds the spirits of our ancestors. I think of all the Indian people who have lived and died here, laughed and cried, struggled and survived on these lands, and somehow I sense and believe that their spirits remain here amongst this land, the rivers, the forests, and on this very Mountain itself”. ~ Joseph Jack Cowichan Tribes.